After gaining promotion, the Bulls’ new Vanarama National League North campaign has seen Hereford start the new season in the same sort of form that helped the club lift the Southern League title. Consistency remains the watchword. Peter Beadle’s side are unbeaten, following the opening two games, and head to Curzon Ashton on Saturday not having conceded a goal so far. But what will Bulls fans find at the Tameside Stadium? Ruth Walkden and Simon Wright look ahead to the weekend. 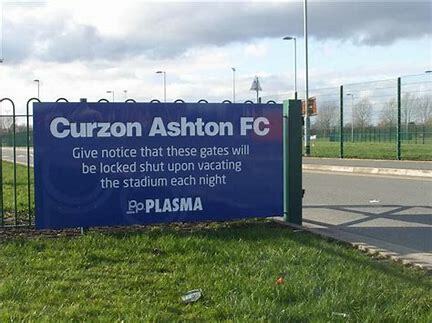 Curzon Ashton: Saturday, 11th August. Tameside, Greater Manchester hosts our initial on-the-road Saturday fixture. A club few supporters are familiar with yet one which will certainly impress with the stately nature of their Tameside Stadium complex. Think Biggleswade with more parking, a real road and an eye-catching statue. This memorial celebrates 3 locally-born footballers, Hurst, Armfield and Perrota (the latter well-known in Italy). Many of our readers are older than the “Nash”, a club founded in 1963 following a merger in the Manchester Amateur League. As recently as 2014, Curzon had never played above Step 4 and continue to live their dream. In an area overloaded with football clubs, Curzon use the community route to boost their image and ultimately attendances. They put on sessions weekly in and around their training pitch for children, older people, disabled people, refugees and other disadvantaged groups. Last season, the Nash averaged 531 in their 4,200 capacity arena. Curzon’s record attendance is 1,700 for their televised FA Cup Round 2 tie against Wimbledon. (Their short-term tenants FC United routinely topped this figure). There are 520 seats in the Main Stand which is impressively elevated high above the pitch. In addition, there is a large covered terrace opposite with 7 rows of open terracing at either end. The stadium does feel very open, enhanced by all the green spaces around it. The Nash are keen to keep their football accessible, charging £12 adults, £6 concessions and students plus £3 for U16’s. Imagine their senior support will be taken aback by the Edgar Street pricing. Proper Northern catering here with pies, chips, peas and gravy served in the Snack Bar, which boasts tables and chairs. Decent stuff too based on my previous visits. The Nash Bar is a recent portacabin addition to the Stadium. The nearest pub alternative is quite a walk. Free car parking is right outside the stadium. There is a parking overflow area at the complex entrance, ideal for a quick post-match get-away. Curzon are a friendly, welcoming club who deserve to succeed. By Road: OL7 9HG (290 miles return) Leave M60 at J23 and take the A6140 towards Ashton. At traffic lights past the cinema, turn left onto Richmond Street. Over the railway bridge and mini-roundabout and first left into complex. By Train: Do-able! Just over two hours to Manchester Piccadilly with a choice of trains. Pick up the Metrolink for a 30-minute tram ride (£3.80 return) to Ashton West Metrolink – a brisk five-minute walk downhill to the stadium.